1.Highlight the range of cells to which you want to apply the conditional formatting. 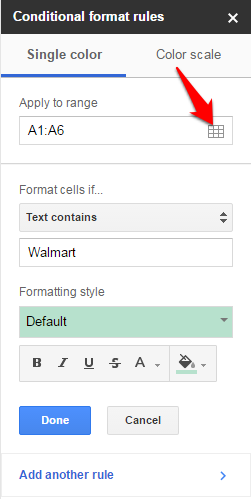 Go to Format>Conditional Formatting. 2.The Conditional format rules panel appears on the right side of the screen. Click Add new rule. 3.Check to see if the ranges in the Apply to range box are correct. If not, click in that area to type in the correct range or select it. You can also add multiple ranges to which the rule applies. This is helpful because it means that, once you set up this rule, you can use it throughout your workbook by adding ranges to the rules. 5.Now set the format options. You can choose a default option or manually select the font color, cell background color, and text effects (bold, italics, underline, and strikethrough). 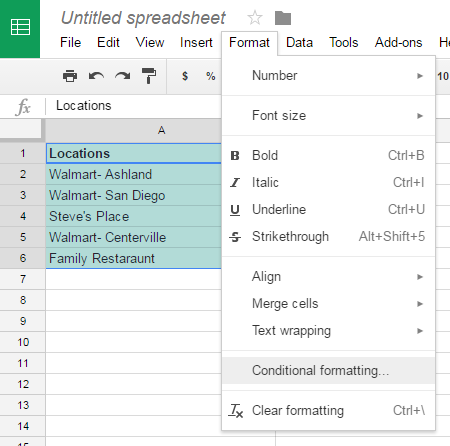 Unfortunately, you cannot currently add or change borders using conditional formatting in Google Sheets. I will keep the default formatting, which is a light green highlight. 6.Your rules are shown real time in your spreadsheet. When everything is working to your liking, click Done.